By not compromising on the luxurious details, British-based Pantherella has managed to hold its place in the oft-overlooked world of socks in spite of tough, often cheaper competition. When considering the various aspects of one’s wardrobe, rarely does the humble sock stand out as a sartorial beacon, lumped in with other garments traditionally designed to be hidden away from view. Looking at the technical demands required to make a pair, they do somewhat pale in comparison to more obviously showy pieces, like a carefully cut blazer or sharp pleat-front trouser. But there are those that take the task of sock making as seriously as any tailor would a suit, and British-based Pantherella is one such brand, championing the craft required to create a phenomenal pair. In fact, there aren’t many UK-based companies still dedicated to the old-world methods of sock making, most lost at the hands of offshore production, where quality and comfort are low priorities to price and speed. Pantherella is a stubborn stalwart, a sock maker’s sock maker, refusing to compromise on the principles that earned the brand its reputation in the first place. Founded in Leicester in 1937, the company was an integral member of The Midlands’ hosiery industry, which at the time was a booming hub, supplying the UK and abroad. As the story goes, founder Louis Goldschmidt saw a gap in the market for fine gauge socks as an alternative to the bulky pairs more prevalent at the time, pioneering discreet varieties better suited to smart shoes. The brand quickly became renowned for just that, and was picked up by large department stores such as Selfridges and Harrods, where it’s still stocked season after season. Pantherella CEO Justin Hall says the brand’s legacy is a testament to the quality of what they make, as well as the vast offering for customers, particularly when it comes to colour and finish. “Once people have bought into Pantherella and have an understanding about what they’re getting, it is pretty much a permanent part of someone’s wardrobe. Using the finest materials is a major factor in achieving the look and feel of Pantherella’s socks. 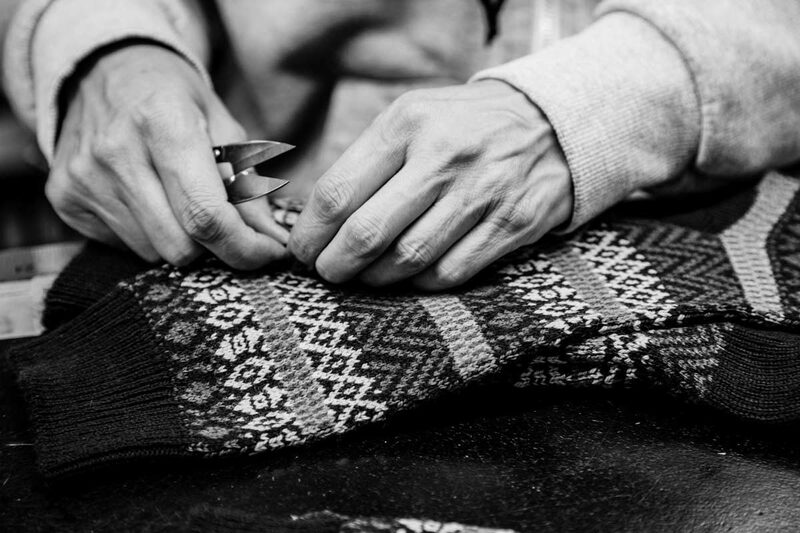 Twice a year, the brand’s lead designer attends trade shows to source the finest yarns – mainly from Italy – as well as scope out trends in terms of cut, shade and pattern. Inside Pantherella’s factory, which still operates in Leicester, those materials – 30 tonnes of Egyptian and Sea Island cotton, merino, silk and cashmere - are stacked high, in classic and vibrant hues, ready to be spun. As the yarn moves through the factory, the knitting machines whir into action, spinning those colourful lengths into tubes. Any footwear connoisseur knows there’s no one-size-fits-all, in terms of both actual dimensions and occasion, which is precisely where Pantherella thrives. Its offering of 240, 200, 176 and 96-stitch gauge, in plain, ribbed or herringbone weaves, mean there really is a sock for any shoe, boot or slipper. Although not technically demanding, the sock has a heavy burden to carry – the weight of a human, to be precise. That’s why, although soft to the touch, the yarns are also rigorously wear and wash-tested to make sure each pair won’t pill, develop holes or bleed colour. The factory has a quality control lab where the knits are tested for shade continuity, moisture resistance and washing fastness. They also go through heel testing, where the cloths are rubbed for up to 20,000 cycles to mimic tread. While the supple yarns and fine gauge are an obviously tactile drawcard, there is one rather technical aspect that truly distinguishes a Pantherella sock from your average, and that aspect is in the toe. There are two key ways to bring a sock together: the fastest and easiest is the Rosso method, which joins the ends together with a single seam, much like an overlocker; and linking, where the end loops are stitched together with a single thread, creating a seamless toe. Because Rosso can leave a bulky, uncomfortable seam, all Pantherella’s socks are linked either by hand - which is one of the most skilled aspects of sock manufacturing - or with a machine. Pantherella’s Leicester factory turns out roughly 720,000 pairs a year, sold under the brand name as well as to private labels, which include some of Savile Row and Jermyn Street’s most renowned stores, as well as brands such as Vivienne Westwood. Humble though the sock may be, making one, and indeed perfecting one, is a disarmingly large, complex and detailed operation; one that engenders no small amount of passion from those involved. Pantherella makes the argument for the sock being the true avatar of discreet luxury: unassuming yet considered, right down to the last stitch.